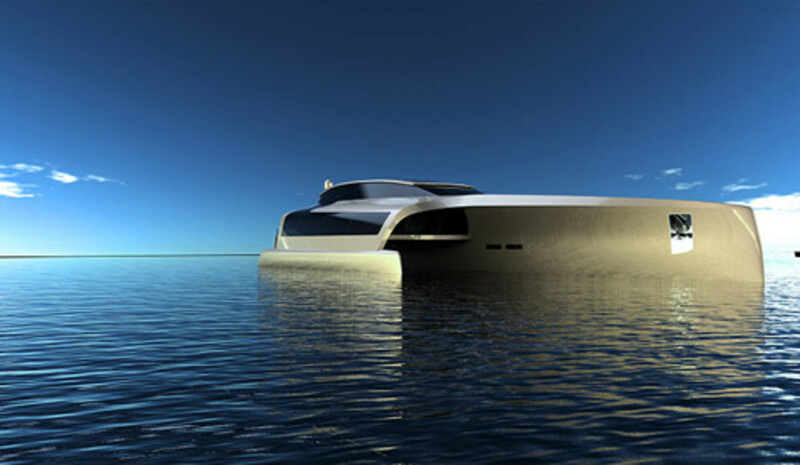 Sunreef introduced its first concept luxury trimaran with a 210-foot poweryacht. The project was prepared at the request of a potential client who was looking for an extraordinary multihull. Using the interior space of all three hulls, the Trimaran 210 has 950 square meters (roughly 10,225 square feet) of living space. Operated by 12 crewmembers, the yacht will comfortably accommodate as many as 14 guests in comfort and privacy. The top deck has a 125-square-meter (1,345-square-foot) dining area for 14, the captain’s private cabin, an internal helm station and a guest day head. There is also a private king terrace aft, which can be accessed via a lift connecting all floors on the yacht. The main deck was arranged to maximize available space without losing roominess. The 220-square-meter (almost 2,370-square-foot) saloon can be arranged in different ways. There are four areas from which guests can admire views through the window wall without being disturbed. The boat has also six guest cabins, which are in front of foldable private balconies, with queen beds that are positioned transversely to the axis of the boat. The master suite in the fore features two separate walk-in closets, his and hers toilets, two study areas, a panoramic view and private access to a 30-square-meter (323-foot) front terrace. The lower deck is dedicated to the crew. From the exterior, it can be accessed from the aft through the garage for the water toys, including sea bobs and two jet skis. This deck also includes a fully equipped galley, crew mess and crew cabins spread all the way to the front of the hull, where the utility room is placed.